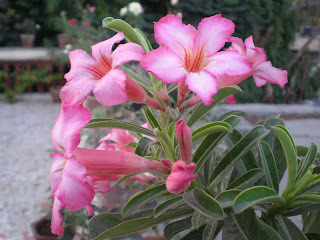 Today's post is about the famous Adenium, (A. obesum Family Apocynaceae) commonly called desert rose. This succulent is a natural bonsai, very famous for its pink showy flowers. Of late I have seen many more varieties with double colors with pink as the basic color. This plant has been with me for almost ten years, and I have never had any problems with it, except for a few aphids which are easily removed by neem oil application. I have not repotted it nor have I fertilized regularly. In fact some years I have been very negligent about the care it should receive during the monsoons- the caudex ie the swollen base of the stem is liable to rot if it gets too much water. I have never tried to grow the plant from seed, though I have read that it is regularly done. The seeds may not rise to genetically identical plants, but advantage is that the caudex in seedlings is formed earlier than in plants from cuttings.